Reconnect with friends and memories from the Seattle Pacific University era of your life at Homecoming 2015. Attend the Alumni Reception, enjoy the theatre, cheer at the basketball games, and more. 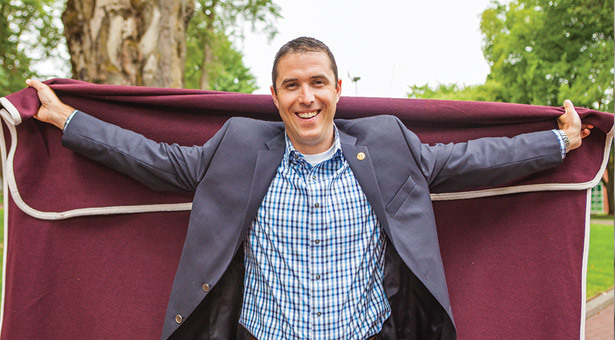 Bryan Jones, alumni and parent relations director, still has his SPU crew blanket. When Bryan Jones ’99 looks out the fourth-floor window of the SPU library, he sees places rich in history and relationships that have shaped every step of his SPU career. “As I work here, I develop new memories,” says SPU’s new director of alumni and parent relations. “But if I stop and think about it, my student memories come rushing back.” This view — looking east from the Library toward the Highway 99 bridge — is just the first stop in Bryan’s three-part personal tour of campus. Instead, he ended up working with high schoolers as an admissions counselor, from his office in Demaray Hall (visible through the Library’s north-facing windows). Hired in 2001, Bryan eventually became assistant director for undergraduate admissions, helping hundreds of families and their students find a place at SPU. The tour’s second stop is Hill Hall, where Bryan spent his freshman and sophomore years, a “transformative” time. His faith and friendships flourished among the Centurions, a men’s service and discipleship club (a group that he now advises). In his junior and senior years, Bryan served as a student ministry coordinator and then a residence hall ministry coordinator in Ashton. The last stop on Bryan’s campus tour is a Brougham Pavilion display of historic SPU Crew photographs. “I’m not a morning person,” he laughs. “But I got up at 4:45 in the morning and rowed out on Lake Union for practice.” In an image from 1996, he’s a freshman rowing in the Men’s Novice 4 at the Pacific Coast Rowing Championships. “We won that regatta,” he says, “which qualified us for the national championship.” In a 2000 photo, he’s one of the smiling Dad Vail Championship silver medalists. Crew taught him commitment and discipline, and he cherished the camaraderie. One teammate rowed even further with him: He married Kristen Goetz Jones ’01 ’05, MSN ’09. Making — and keeping — meaningful connections is a gift that served Bryan well in 2011 when, after a decade in the admissions office, he went to work establishing lasting relationships with alumni donors as an SPU development officer. And it will continue to inform him in his new role as he connects with alumni and parents, inviting them to help SPU into a bright future through student mentoring, professional networking, financial support, and volunteer service. Want to get in touch with Bryan? Reach him at bryan@spu.edu, 206-281-2250, or meet him when you visit campus and return to your own special campus spots at Homecoming.